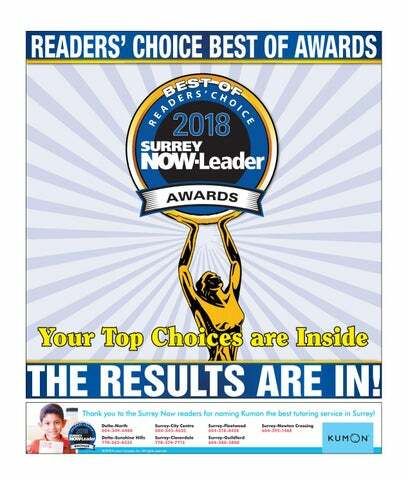 Your Top Choices are Inside Thank you to the Surrey Now readers for naming Kumon the best tutoring service in Surrey! ©2018 Kumon Canada, Inc. All rights reserved. WELCOME TO THE READERS’ CHOICE BEST OF SURREY CONGRATULATIONS are definitely in order. We are proud and honoured to present this year’s winners of the Surrey Now-Leader’s ever-popular Readers’ Choice Best Of Awards. We would like to thank our readers who took the time to cast their votes. Our annual readers poll demonstrates the strong connection local businesses have with their customers. The businesses recognized in these pages have worked hard to be known as The Best and have earned their customers’ loyalty and respect. We are grateful to be part of this process and we strongly believe in our community and the businesses that contribute to making this one of the best places to live and do business in. So, to each of these businesses, we say congratulations for your success. Being named one of the Top Three in your business speaks volumes about the impact you are having in our community. Be proud of this achievement and don’t be shy about spreading the word. You’ve earned it. Proudly serving the Surrey seniors community. Featuring gorgeous gardens and a magnificent courtyard, Fleetwood Villa offers modern facilities and a warm, inviting atmosphere designed for all lifestyles. Our retirement residence opened in 2005 and features 86 Independent Living suites and 80 Assisted Living suites. Choose from a selection of bright and spacious studio, one and two-bedroom options including private balconies and patios, kitchenettes and more. Your first choice for independent or assisted living in beautiful Surrey, British Columbia. Thank you for recognizing RBC as one of the top three financial institutions in the 2018 Surrey NOW-Leader Readers’ Choice Awards. +1-855-255-8933 ® / ™ Trademark(s) of Royal Bank of Canada. Canada’s only not-for-profit grocery & furniture store. All proceeds go to charity. THE TOP 3 BEST CHARITIES IN SURREY! Just 3 of the reasons why we have been voted a winner! YOUR BEST PET SUPPLY STORE Best Price. Best Service. Best Selection. Corner of 82nd & Scott Rd. Thank you for voting for Diamond Sweets! Happy Diwali! to our loyal customers for voting for us! Thank you for voting us the #1 jeweller this year! THANK YOU FOR YOUR VOTE AS ONE OF THE BEST GROCERY STORES IN SURREY! Our team looks forward to taking care of your home improvement projects in the future! Helping you to live a pain free, active lifestyle. Jullian, Judy and the rest of the Akari family would like to thank everyone who voted this year. We are grateful for being recognized as one of the top Japanese restaurants in the area. We hope to welcome you into our restaurant soon. Thank you for voting us Best Garden Centre and Florist in Surrey Again! 54 Years in Surrey And Our Future Is Still Growing! THANKS FOR VOTING US BEST BREAKFAST, BURGERS & FAMILY FRIENDLY RESTAURANT! The Civic keeps getting better. Since 1998, the Civic has been Canada’s best-selling car and it’s no wonder. The redesigned exterior and impressive performance of the 2019 Civic solidify its exciting evolution. The sport-inspired design is perfectly complemented by an available 1.5-litre turbocharged engine, while the striking interior is designed with both comfort and safety in mind. And with the Honda Sensing™ suite now standard across the Civic lineup (excluding Si and Type R models), you’ll drive with even more confidence. Wherever the road leads, the Civic will lead the way. Congratulations to the Winners of the 2018 Honda Civic Canada Day Draw & the 2018 Honda CRV Draw! Available 18” aluminum-alloy wheels (grey). Underneath its aggressive-looking body sit available 18” aluminum-alloy wheels. They complement the bold look of the Civic. Available one-touch power moonroof with tilt feature. Once you’re in and buckled up, get ready to take in the view. SImply tap a button to open the available power moonroof with tilt feature and let the world in. Exterior styling. The Civic is low slung and definitely looks like fun. It has an aggressive stance, a sporty look and sleek lines that make it stand out. Standard LED daytime running lights and available LED headlights. Brighten up your day with standard LED daytime running lights and available LED headlights. *Selling price includes Freight and PDI. Thank you for voting for us, Surrey! Serving Surrey for 30 years. We’re honoured to be voted one of the top three financial institutions in Surrey. It wouldn’t be possible if we didn’t have institutions in Surrey. It wouldn’t be possible we didn’t have the greatest members. We thinkifyou’re the best too. the greatest members. We think you’re the best too. Vendors of fine fruits and vegetables year round. Growers of organic vegetables in season. CLOSED Thank you for your incredible support over the past 58 years. We wish you God’s every blessing. Made with Single-orig melted Get it in dark in chocolate , milk, or wh ite! IN BUSINESS SINCE 2003 Thank you so much for your vote! We look forward to seeing you again! SURREY’S PREEMINENT LIVE MUSIC VENUE, FEATURING LIVE MUSIC 4 NIGHTS A WEEK GOLD MEDAL WINNER BEST PUB, 3 years in a row! The Chalioulias family and staﬀ would like to thank all of our wonderful valued customers for voting us the best Greek Restaurant in Surrey & North Delta again! So much of your positive patient experience happens behind the scenes. Dr. Kanani tells us, “At our Guildford Orthodontics office in Surrey and Langley Orthodontics office in Langley, we use the latest technologies and treatment techniques designed with your safety in mind. For example, digital radiography protects patients from unnecessary radiation and is also a more environmentally friendly technology, as it avoids the use of harsh chemicals associated with traditional X-ray processing.” Additionally, the office offers a paperless integration of all data-management which allows for instant access to patient information at each patient chair and is a ‘green’ alternative to paper documents. Technology also plays a role here with the use of intraoral scanning technology to take virtual impressions of a mouth instead of traditional impressions. “Many adult patients come to us for Invisalign or tooth-coloured braces,” noted Dr. Kanani. “Having said that, the Canadian Association of Orthodontists recommends every child have an orthodontics screening exam by age seven to rule out jaw problems like crossbites and underbites and large overbites.” Of course, there’s far more to Dr. Kanani’s world than just Invisalign. He feels that correcting the position of someone’s teeth can improve self-esteem as well as oral health, often changing their life. “Orthodontics is the modern twist on traditional dental care,” Dr. Kanani said. “It’s a huge responsibility and my team, and I feel honoured every time a new patient entrusts us to care for their smile.” Everyone who lives in Surrey is proud of their multi-cultural vibe, and it’s the same at the office. It can be hard for some to understand the technicalities of orthodontics if English is not their primary language. They can serve you in Punjabi, Hindi, Mandarin, Vietnamese, Polish, as well as English. There is no better feeling than doing well while you are doing good. The team at Guildford Orthodontics recognize that. Dr. Aly Kanani is a lifetime member of the UBC Chancellors Circle for significant donations to UBC to create the double Kanani Conference Rooms used by faculty and students daily. They also support numerous local causes including all levels of Surrey schools, Dry Grads, numerous sports teams, Surrey Food Bank, local scholarships, as well as many other charitable endeavors. Peace of mind; award-winning service and a team of professionals who are committed to bringing you the smile that you can be confident about — Guildford Orthodontics Centre is there for you. 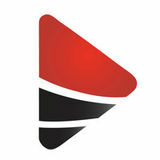 Schedule a no-obligation consultation with them online at guildfordorthodontics.com, or phone 604-5892212. They are located at Suite 200 10203 152a Street, across from Guildford Town Centre mall. The Basant Motors Family would like to extend a “Thank You” to the Surrey Now-Leader Community for voting us one of the top Pre-Owned Auto Dealerships in the area! Without the support of the community, we would not be able to do what we do. We understand that there are many different car-buying options to choose from and your growing support allows us to be able give back to the community. This year alone we were able to give $27,000 in scholarships and look forward to giving more in the future. At Basant, we do not feel like we have customers, we feel as though we are adding members to our family! We will continue to provide the utmost care and premium customer service that our valued clients deserve. • Where you will Know your neighbours.